Almost a Festival of live tango music, Sydneysiders will be treated to two nights of fabulous local musicians playing the music they love for those who love to dance. Not to be missed. 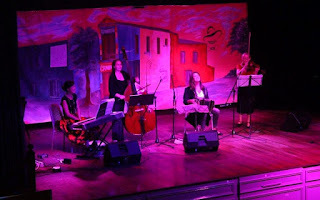 Fuego Blanco with bandoneonista Maggie Ferguson feature at the Gran Milonga at Petersham Town Hall Members of Fuego Blanco, Kate Agostino, Isabella Brown, Annie Gard and Annie Zhang have studied at the Sydney Conservatorium of Music and the University of NSW. The group has been together for 6 years and began to play tango under the mentorship of Maggie Ferguson. They have studied in Buenos Aires with German Martinez and Ignacio Varchausky and have performed at the Resonate Festival in Canberra, the National Folk Festival and with the Tango y Nada Mas Production in Sydney in 2013. Organised by Tango Synergy and Tango Conca.